First of I would like to introduce his highness that was so kind to really put on a show right at the front glass so I could finally take some decent pictures of this lovely creature. It was interesting to see how it removed its decoration that it had upon collection and replaced it with the stuff it found in my tank to blend in perfectly. Pictures below are on the day of collection. Unfortunately electrons and electrical switchboards werent obedient during my absence from home over the Christmas period. One of the Powersupplies of the Pumps must have gotten damp or gotten a splash that tripped the fuseboard and caused a power outage for a good while. When a friend came to check on the Aquariums all was dark and when he switched the fuse back on it looked quite dead. 😦 Not again! Not sure how long the power was out but it was more than 24h I guess. When I came back home a week later the water was clean again and it was surprisingly good looking however my lovely two rock cook I got from Peter and the small corkwing where the causalities, what a shame! 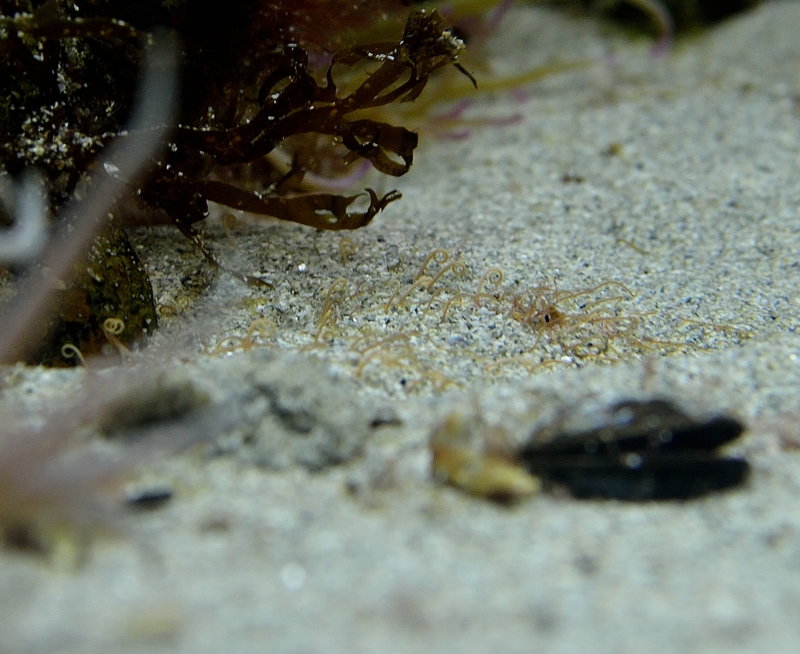 The two spotted Gobie now is the only surviving fish. Its Murphy’s Law that these things always happen when I am not at home for a while which is fairly rare! But this is it now, its the second time I had this situation with powercuts when I am not home and I am going to look into getting a backup airpump to kick in once power is off. 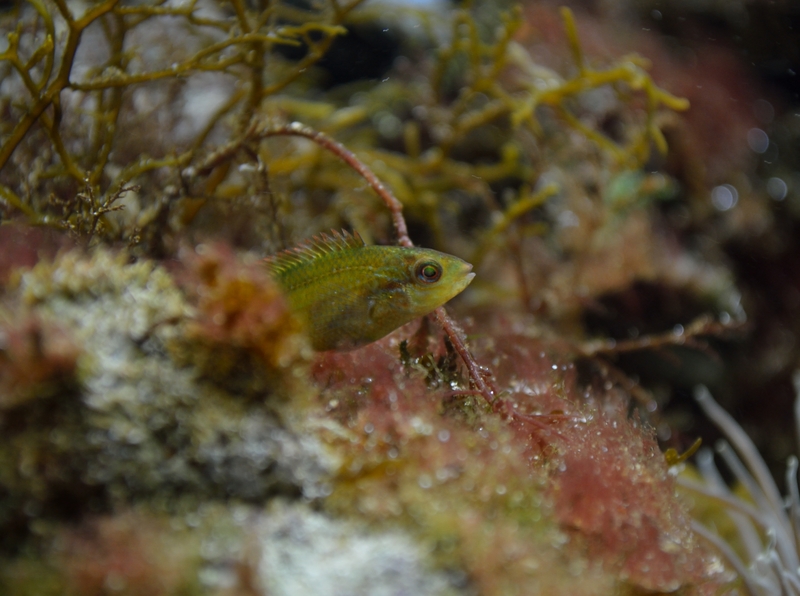 At least I got some Pictures of the Rock Cook Wrasse’s before I had left, so this is in memory. They where stunning with the blueish shimmer and are nicely free swimming in the water collumn unlike the Corkwing’s that tend to stay close to substrates or seaweed. …and here the little Corwings last appearance on my Memory card. On the upside, there was no flooding or other disasters and all other creatures seemed to have survived. The black Brittle Starfish that has at least tripled in size since summer has made a nice appearance during the night trying to scavenge the left overs of the Mussels I fed during the day. 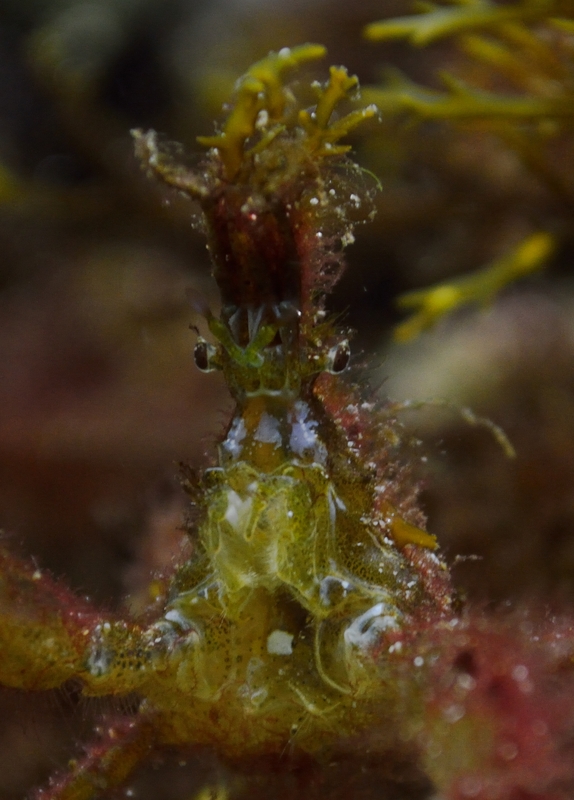 I like this creature, kind of creepy and very interesting as its a scavenger and a filter feeder. 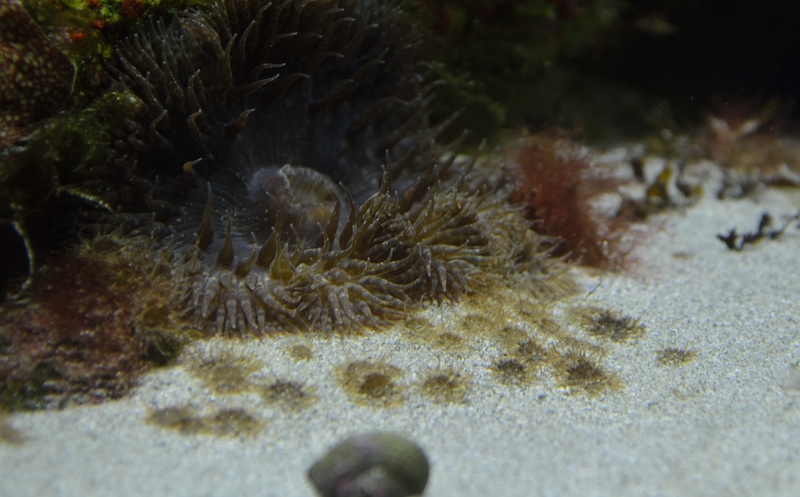 Not sure about the exact species of this Anemone but its breeding marathon is finally over. Always wanted to get rid of it as its reproducing a lot! The awkward location made it impossible without taking half the Tank apart. One day it was really weirdly shriveled up and possibly dead already as it was really easy to pick it off the rock so I removed it from the Tank. As can be seen on the picture there is plenty of Juveniles to follow in its foot steps anyway. A lot of them have spread already to all ends of the tank. Found this really weird creature on some Fucus I brought back home from a trip in November. Possibly Synisoma Acuminatum an Isopod? It had some serious grip on the weed and it was impossible to get it off without harming it so I just added it to the tank to see what happened. Havent seen it ever again but who knows it might still be in there. Thought it was a crawling creature with just legs and was seriously baffled when it darted away swimming around the place quite skillfully like a prawn with tiny little fan/paddles in its last segment of the body. At first I was a bit shocked when I saw these one day. Guess its some sort of spaghetti worm of the Terribellidae Family. At first I thought its a lot of small worms but it seems to be all the fangs of one big worm. The area was quite dark from overhanging seaweed that I removed just before the picture. They where gone the next day so I guess the worm has moved to another shady place to arrange his trap.